A Canadian mining company wants the federal government to suspend millions of dollars in foreign aid to Mongolia until the Asian country pays for taking the firm’s uranium mine and giving it to the Russians. The request, made Tuesday, comes exactly one year after a trade tribunal told Mongolia to give Toronto-based Khan Resources Inc. more than $100 million in compensation for the lost uranium mine, and is the latest gambit in a long-running dispute sparked by Cold War-era geopolitics. It also coincides with a major mining convention in Toronto next week, where Mongolian officials plan to pitch their country as a great place for mining companies from Canada and the rest of the world to invest. Mongolia receives about $4 million in aid per year after the previous Conservative government designated it one of 25 “countries of focus” for foreign aid in 2014. A major focus is building the Mongolian government’s ability to manage the country’s mining sector, where Canada is the second-largest investor after China. Mongolia’s ambassador to Canada, Radnaabazar Altangerel, said in an interview Wednesday that Canada’s assistance has been extremely important in helping his country manage its rich reserves of copper, gold and coal, as well as develop its agricultural sector and improve the health care system. 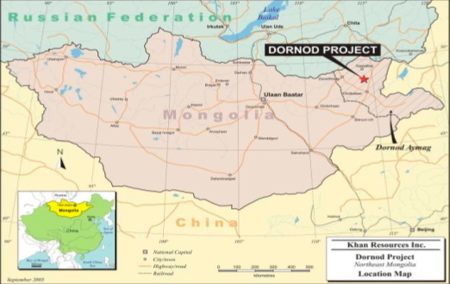 But those aid dollars have become a target for Khan president Grant Edey, who has been fighting for compensation since the Mongolian government all but seized his company’s Dornod uranium mine in the northeast of the country in 2009, and gave it to a Russian state-owned company. Several experts and industry insiders said Khan was essentially caught in the middle when Moscow, which had heavily supported Mongolia during Soviet times, called in some favours and pressured Ulaanbataar to secure access to key natural resource reserves. Those included the Dornod mine. In response, Khan took Mongolia to arbitration. On March 3, 2015, a three-person panel ruled in favour of the company and ordered Mongolia to pay US$100 million in compensation. But the government hasn’t paid up. Instead, it has appealed the ruling in France. But the ambassador said the dispute does not reflect how Mongolia generally treats mining companies. He noted Mongolia received an international award last week for transparency in its resources sector, and Export Development Canada recently approved a $4-billion loan to help fund a major mine expansion. Altangerel said the two sides will try to hammer out a settlement on the margins of the Prospectors and Developers Association of Canada’s mining convention in Toronto next week, where Mongolia’s finance minister will host a special session designed to attract new foreign investment to the country. Global Affairs Canada spokeswoman Diana Khaddaj said in an email that the government has taken “every opportunity to urge the Mongolian government to comply with the arbitration ruling.” This includes raising the issue directly with Mongolia’s prime minister and several senior ministers, she said. But Edey, who was confident the ruling will be upheld in France, said his company hasn’t seen a dime despite one year of negotiations and previous promises to pay up. That is why he is calling on the federal government to step up the pressure and consider other avenues, such as withholding aid dollars.